Songkran is not only Thailand’s most famous festival but its also one of the most important events on the Buddhist calendar. The event marks the beginning of the traditional Thai New year. The Songkran festival starts on the 13th April. It goes on for three days, yet in some areas of Thailand it only lasts one day, the 13th and other areas it lasts for 7 days. Songkran festival originated centuries ago when it was a purification rite, in both a physical and spiritual sense. Temples, Buddha images, and houses where tided and cleaned as a way to clear away negative influences. The traditional celebrations were a gentle sprinkling of scented water. 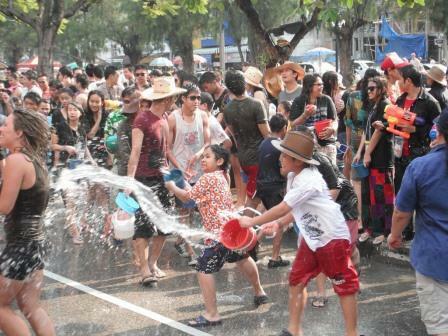 Songkran has now become the biggest water fight in the world. The throwing of water, well the mass water fights, have become a huge part of the celebration over the past 2 decades everywhere in Thailand, so don’t be surprised if you get splashed with icy cold water, well when we say splashed, we mean drenched in water, shot at you from every angle form a variety of colored water pistols, buckets and anything else that can hold water. You will also become covered in powder which even to this day after being in Thailand for 10 years, we have no idea what it is. The whole of Phuket island stops on the 13th and set up make-shift water splash stations on the side of every road. Pick up trucks are filled with Thais and tourists wearing bright Hawaiian style shirts with huge buckets of water, mostly with a chunk of an iceberg floating in it to make it as cold as possible, and all are armed to the teeth with some of the largest water guns you will ever see. Although everywhere on Phuket celebrates Songkran, the main water fight generally takes place in Patong with Bangla Road being the epicentre and continues late into the night. It is an amazing place to be with music blasted out from every bar and restaurant, people laughing, dancing and having great fun, while soaked from head to toe. If you’re looking for more of a cultural experience then head into Phuket Town where they have live music and traditional performances, but you will still get wet. Top tip – waterproof phone cases and bags will be your best friend during Songkran. Stay well, warm and have fun, catch the full weather forecast HERE and HERE. It doesn’t matter if your young or old if you are out and about during Songkran you will end up getting wet, in fact getting soaked, but its amazing fun and a true bucket list experience.